A little drizzle couldn’t keep me away from my pooches! And the dogs I took out didn’t seem to mind the rain, either. They were both very excited to be able to stretch their legs and sniff around. 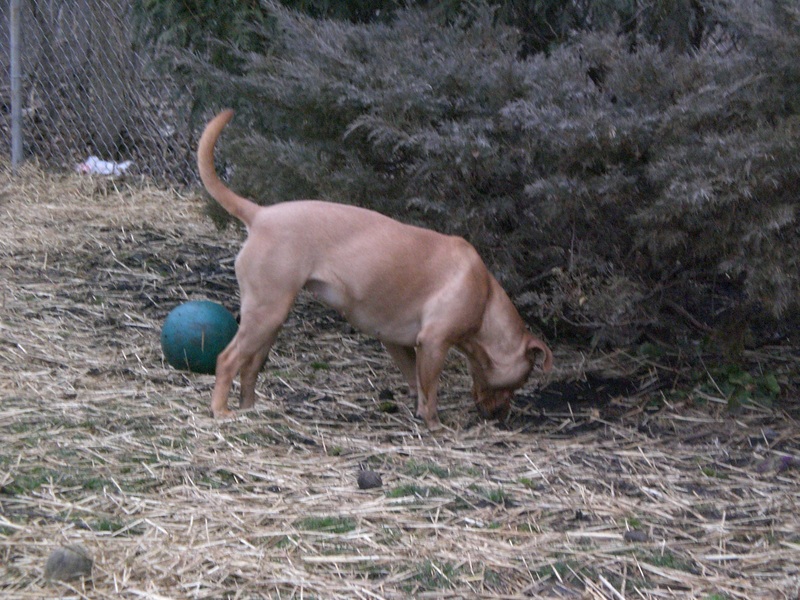 Chili is an adorable two-year-old Labrador Retriever mix who loves to play. 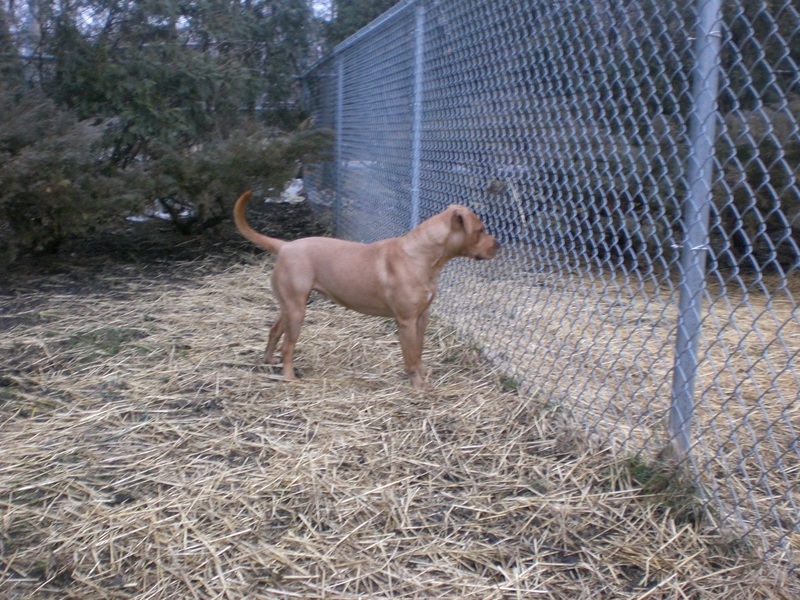 When we got inside the off-leash run, she didn’t seem to be particularly fond of the dog on the other side of the fence. All I had to do was throw a tennis ball, though, and she was off and running and ready to play with me. She loved the big, green ball with a handle that she could hold in her mouth even more. She would pick it up, run with it, trip over it, shake it around, throw it in the air; this girl can entertain herself very well. But she would much rather have human friends to play with! Chili had lots of energy, but was also happy to stop playing fetch for a few moments so I could pet her. She is so soft! And with a face as cute as hers, who can resist? 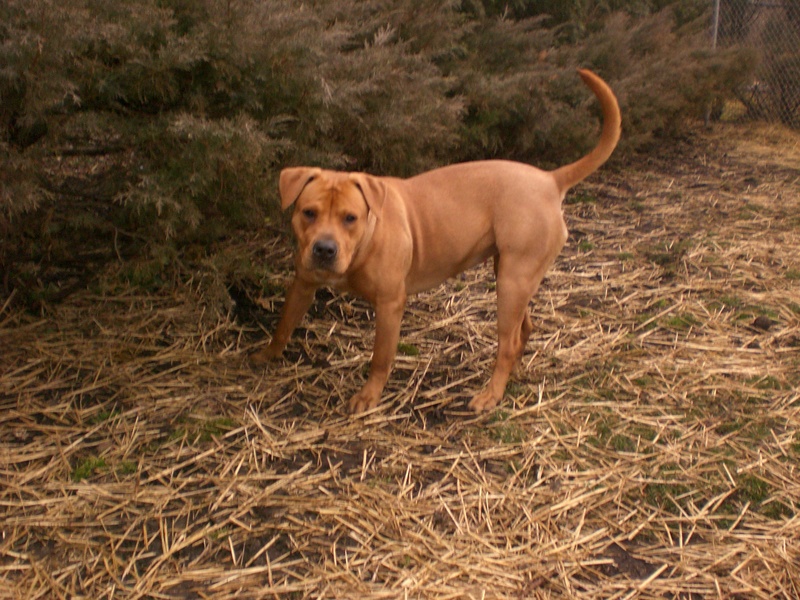 Firefly (who has since be renamed Lady–that is the name you will find on her info card on the front of her kennel) is an angel, which most people wouldn’t expect from her appearance. 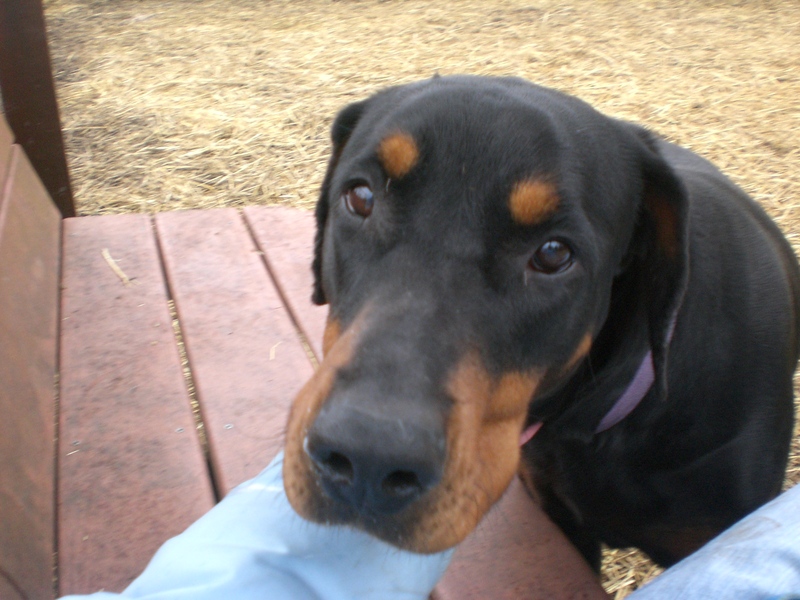 This five-year-old almost pulled me over when we first started our walk, but she can’t help the fact that she’s a Rottweiler/Doberman mix and I have no upper-body strength. 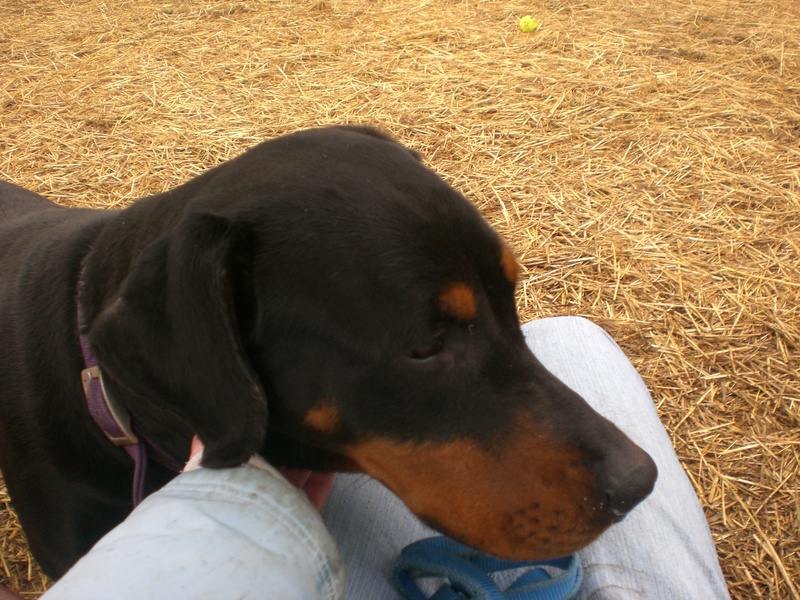 If you are looking for a big dog with an even bigger heart, Firefly is your girl. Once we were inside the run, I thought she would want to run around. Instead, she was perfectly content to sit next to me and put her head in my lap. As long as you’re petting her, Firefly will stick by your side. I thought she should get some exercise, though, so I walked with her around the run and gave her a chance to sniff in the bushes. Just look into those loving eyes and you’ll fall in love! Firefly and her brother Ryder (who I plan to take out next time) both have many years of experience as a family pet. Unfortunately, their owner had to move to an apartment building that doesn’t allow dogs, and that is how they found themselves at Orphans of the Storm®. Don’t be turned off by Firefly’s initial strength; she’s a real sweetheart who is looking for a new family to love. 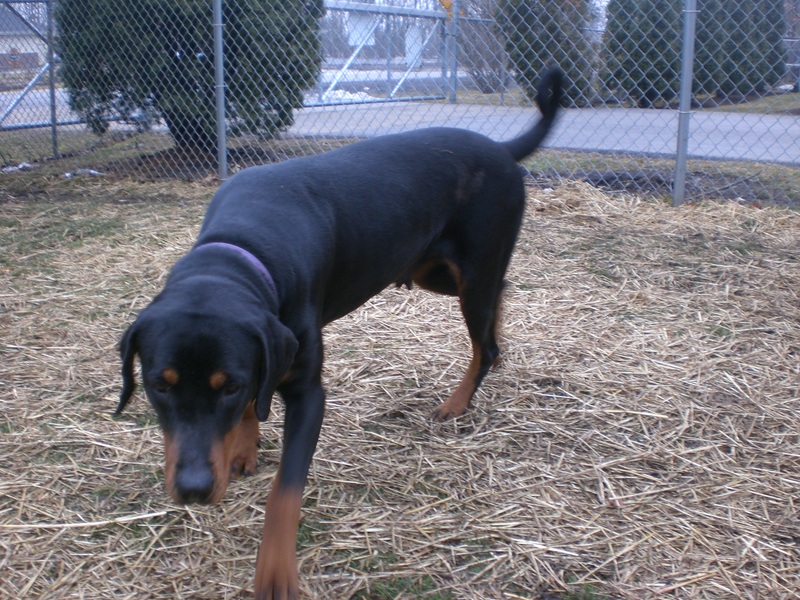 Posted by Meet the Pooches on March 3, 2012 in Dog Profiles and tagged adoption, animal shelter, animals, Chicago, Doberman, dogs, Labrador Retriever, Orphans of the Storm, pets, Rottweiler. Chili looks and sounds like a great dog!! How is she with other dogs? We have a 10 yr.old lab/shepherd mix female.Also is she spayed and housebroken? Hi Brad! Orphans of the Storm encourages people with current dogs to bring them to the shelter to make sure everyone gets along. I don’t believe Chili is spayed yet, but all dogs are spayed/neutered before they move to their new home (covered by the adoption fee). I’m not sure if she’s housebroken, but labs are smarties (as I’m sure you know, having a lab/shepherd mix) so if she isn’t, she would probably learn quickly!